What do you think is the #1 obstacle in your path to reaching your guitar playing goals? It’s also not that you “don’t know enough about music/guitar playing”. The rate of your progress doesn't depend on how much you currently know about music. The biggest killer of your musical progress is the time you waste while you practice guitar (without realizing it). Your progress becomes much faster when you maximize every single minute you spend with your guitar and stop wasting the practice time you have. Test your guitar practice methods to see how much you know about how to practice guitar. 1. Mismanaged Guitar Practice Time. 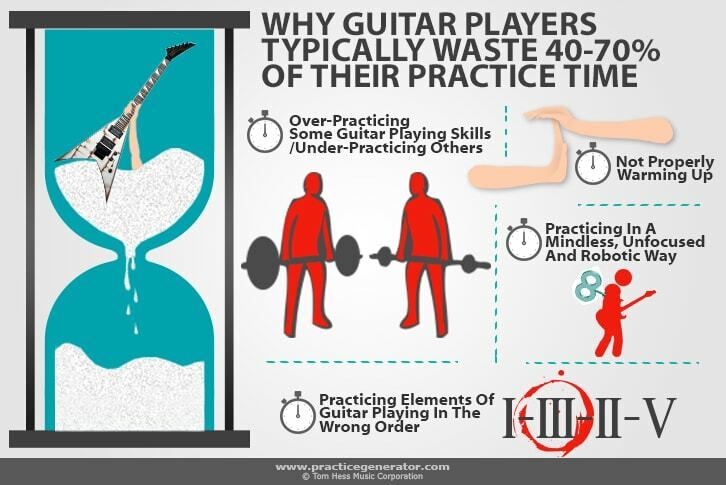 Most guitarists don’t put any thought into how their practice time is allocated. They divide their total practice time equally into the number of items they have to practice. This is wrong. Different musical skills must be practiced at different frequencies and in different amounts of time per guitar practice session. 2. Instant Gratification Guitar Practice. Most guitarists like to practice things they are already good at. This leaves less time for the areas that really need to be improved in your guitar playing. When any of these elements change, the way your guitar practice time is allocated needs to change as well. Neglecting these principles of effective guitar practice leads to slower progress and unbalanced guitar playing skills. The specific order of items in your guitar practice schedule makes a huge difference in your progress. The order matters both on a macro level and micro level. Macro level refers to the general categories of musical skills (guitar technique, music theory, aural skills, etc.). You must practice items that require the highest degree of mental focus first. Micro level refers to specific exercises within a category (specific technique exercises, specific music theory concepts, specific ear training exercises, etc.). Use the guitar practice generator to have personalized guitar practice schedules created just for you. This removes all guesswork from the practicing process and makes you a better guitarist faster. You probably know that you should warm up before starting to seriously practice guitar. However, few guitarists warm up correctly. Most guitarists think that warming up refers to playing random finger exercises to get their fingers warm. (The more serious problem) Your brain knows that your warm up exercises aren’t your real guitar practice items. Your brain becomes disengaged from the warm up process and allows your hands to go on autopilot. Solution: Stop searching for random warm up exercises for guitar. Warm up using the exact practice items you intend to practice today. Play them slowly and focus on perfect technique as your hands and brain warm up together. Practicing guitar is NOT about playing the same thing over and over again. Effective guitar practice is about developing skills and refining them. Your mind and ears focus on specific elements of your guitar playing and build perfect muscle memory with them. When you practice a scale on guitar, focus on technique in each hand separately. Pay attention to your fretting hand and keep the fingers relaxed and close to the strings. Focus on fretting hand efficiency for several repetitions of the scale. Next, switch focus to your picking hand technique. Make sure that your pick doesn't move more than necessary to keep your motions efficient.You now know several common mistakes to avoid when you practice guitar. The next step is to test yourself and identify your exact guitar practice strengths and weaknesses. This guitar playing assessment helps you make your guitar practice more effective and reach your musical goals faster. Stop wasting 40-70% of your guitar practice time and become a better guitarist faster by using the Practice Generator.